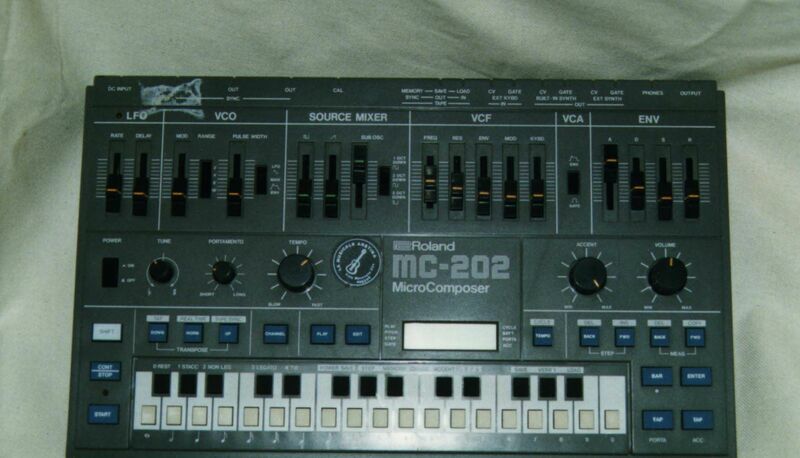 The MC202 is a sequencer and simple monophonic synth with 32 buttons arranged like a small keyboard (F-C). The monosynth is similar to the SH-101. The VCO is based around the ever-so-popular Curtis 3340 chip and features a slider switch for octave (2', 4', 8', 16'), a slider for pulse width, and one for modulation (LFO) amount. The VCO outputs a square/pulse wave, a sawtooth wave, and a sub-oscillator which are mixed together in the "Source Mixer" section. The sub-oscillator is switchable between a square wave 1 octave down, a square wave 2 octaves down, and a pulse wave 3 octaves down. There are knobs which control fine tune and portamento. The VCF section has a slider for cutoff frequency and resonance. There is a slider for each of its control sources: envelope, LFO, and keyboard. The VCA can be controlled by a simple gate or the Envelope. The envelope is an ADSR with a slider for each stage. The sequencer is quite powerful for its time. The MC-202 features a large (for the time) LCD display, upon which all the sequencing editing is displayed. The two available sequences can be played simultaneously using the CV/gate outputs to control another sequencer. The sequences can have a combined total of 2729 events. Sequences can be entered in real time via the pushbutton keyboard or via another keyboard using the CV/gate inputs. This feature has a negative side, though. Since all incoming CV/gate signals are routed through the microprocessor, there is a bit of a lag when the MC-202 is played by a another keyboard or a MIDI-to-CV device. The Sequences can also be programmed using step-time, setting a separate pitch and duration for each note. Also programmable in a sequence is accent and portamento. Accent works the same as in the TB-303, with an accent amount knob that can be adjusted in real time as the sequence is playing. The speed of the sequence is also controlled by a knob. The back panel has a sync input and two sync outputs, a tape interface for saving and loading sequences, CV/gate inputs and two CV/gate outputs (one for each sequence), a headphone jack, and a main output jack.